YouTube is the leading platform for video sharing and marketing. YouTube is a free platform offered by Google. 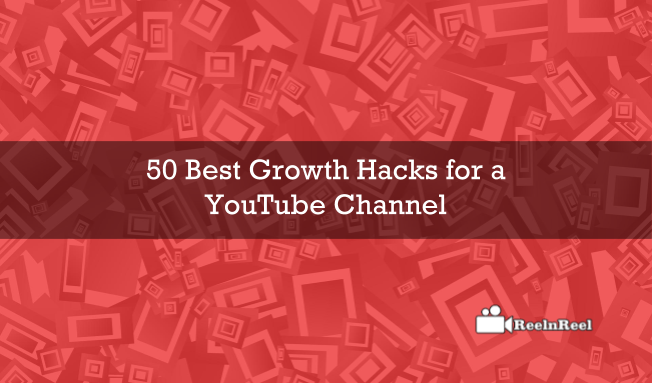 Here are few growth hacks for the YouTube channel owners who must be wondering how to grow the channel and increase the subscribers and reach of videos. 1. Use Annotations to drive traffic to other videos. 2. Use the annotations to get the viewers watch the other videos in your channel. 5. Use YouTube video cards effectively. 9. Do not expect to learn lots of money in the very first few weeks of work. 10. If there are any issues with annotations, description links or cards, fix them immediately. 11. Update the titles and see the effects. 12. Make collaborations with more and more YouTubers. 13. Add subtitles to the videos to increase the viewers. 14. Add a featured image to the channel. 15. Change the channel art often. 16. Also, update the video thumbnails to grab the attention of the viewers. 17. Observe how the top YouTubers grew their channels. 18. Ask the viewers what they want to see next. Create content based on their ideas. 19. Identify the trend specific to your target audience. 20. Observe what specific set of audience watch during specific times such as summer holidays etc and create content especially for them. 21. Try to be the only channel to deliver high-quality content in your niche. 22. A great way to promote the content is to guest blogging. 23. Reach hundreds and thousands of viewers quickly by using social media. 24. Promote the video content on multiple networks simultaneously. 25. It is simple to add video cards just like adding annotations. 26. Create social media accounts for the channel and work differently on each platform. 27. Use Pinterest to publish images and photos. 28. Write blog articles about every video. 29. To get higher visitors, search for YouTube trend algorithm. 30. Subscribe to many channels. 31. Write nice and genius comments to videos. 32. Write comments to trending posts. 33. Give your channel link to the cover phone on the Facebook page. 34. To build the reputation on YouTube, setting short term and long term goals are important. 35. Know the demographic and audience that is interested in what you are saying. 36. Learn about the age group gender and behavior of them collectively or individually. 37. Be actively on YouTube engage within the YouTube community to build following. 38. Leave comments on the new, popular videos and on the videos of those you follow. 39. Track the keywords and trends on YouTube and Google. 40. Free tools are available to track the keyword trends. 41. Subscriber to the popular YouTube starts in your Niche. 42. Learn the new shooting techniques, script writing ticks and other methods of creating the videos. 43. One of the effective methods to grow YouTube channel is a cross promotion with affiliates. 44. Mentions the affiliates in your videos and ask them to do the same in their videos. 45. Going mobile is another great way to attract more audiences. 46. Create highly engaging content. 47. Increase the uploading frequency. 48. Learn to optimize the tittles. 49. Use the keyword in the title. It is proved that proper use of annotations and cards can increase the channel subscriptions. Add a link to subscribe to the channel in the video as a call to action. Use the right tools to help increase the organic viewership.